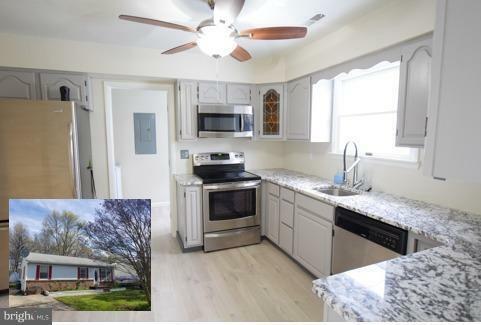 Beautifully updated 3 BR home. New Pergo flooring & carpet. Kitchen w/ granite counter tops & stainless steel appliances. Designer bathrooms. Freshly painted. MBR w/ attached bath. Large living space. Sliders open to huge back deck & yard. Separate laundry room. 3rd BR with charming built in bookshelves. Walk to the community beach! Close to South walking/biking trail & Blue Heron Golf Course.